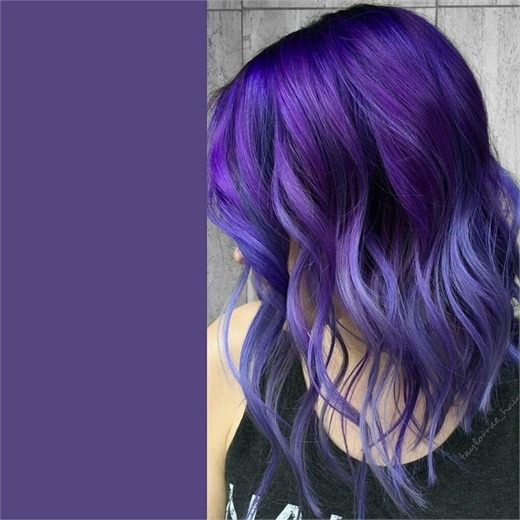 Pantone announced its 2018 Color of the Year will be Ultra Violet: a vibrant purple hue that's been popular for hair color enthusiasts for a few years now. The Pantone site describes the hue as "a dramatically provocative and thoughtful purple shade" that "communicates originality, ingenuity, and visionary thinking that points us toward the future." Whether seen on royalty or pop royal icon Prince, the shade evokes brilliance, emotion and individuality. "We are living in a time that requires inventiveness and imagination," says Pantone Color Institute Executive Director Leatrice Eiseman. "It is this kind of creative inspiration that is indigenous to Pantone 18-3838 Ultra Violet, a blue-based purple that takes our awareness and potential to a higher level." Pravana colorists have enthusiastically shared their favorite Ultra Violet transformations. See the enigmatic hair color formulations below. Created with Pravana Vivids Violet at root and Vivids Silver with drops of Violet through mid-shafts and ends.